This compiled list below combines three lists from Filmsite: the 100 Greatest Films list, the Another 100 Greatest Films list, and The Third 100 Greatest Films list. The films are ordered chronologically and alphabetically by decade. 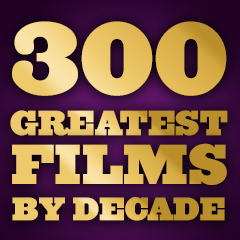 The films marked with a yellow star are from the 100 Greatest Films list. Selection Criteria for these films is described fully. Each of the 8 parts below includes a short synopsis of each selection with links to longer reviews for each film.